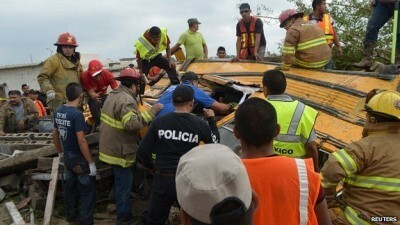 At least 13 people have been killed by a tornado that hit the northern Mexico border city of Ciudad Acuna. Hundreds of homes have been damaged or destroyed in the city, in Coahuila state, just across the border from Del Rio, Texas. The US state has seen severe flooding, with three killed and a dozen missing. Images from Mexico showed cars and buildings badly damaged. Many people have been injured and there are fears the death toll could rise. The missing baby had been strapped into the child-seat of a car, local media reported. He added that it was the first tornado to hit Acuna since the city’s foundation, more than 100 years ago. The tornado only lasted a short moment but that was enough to devastate a community. It struck at a busy time in the morning – people were driving or taking public transport to work. Cars were catapulted towards buildings, roofs ripped off and many vehicles left upended. Residents of Ciudad Acuna are used to hearing about this sort of thing north of the border in Texas, not experiencing this first-hand. The infrastructure clearly wasn’t strong enough to stand up to the impact – the army is helping to search for missing people and neighbouring states have also said they will lend a hand in the rescue effort.